Hicks:"Alright people, let's move like we got a purpose." Burke:"What if that ship didn't even exist? Did you ever think about that, I didn't know! So now if I went and made a major security situation out of it, everybody steps in, administration steps in, and there's no exclusive rights for anybody, nobody wins! So I made a decision, and it was wrong. It was a bad call, Ripley. It was a bad call." Ellen Ripley:"Bad call? These people are dead Burke! Don't you have any idea what you've done here?! Well I'm going to make sure that they nail you right to the wall for this. Your not going to sleaze your way out of this one. Right to the wall!" Hudson:"Oh dear Lord Jesus, this ain't happening man. This can't be happening man! This isn't happening!" Hicks:"Now all we need is a deck of cards." Ellen Ripley:"Uh oh. I made a clean spot here. Now I've done it. Guess I'll have to do the whole thing." Hudson:"He's coming in. I feel safer already." Sergeant Apone:"All right sweethearts, what are you waiting for? Breakfast in bed? Another glorious day in the corps! A day in the Marine Corps is like a day on the farm. Every meal's a banquet! Every paycheck a fortune! Every formation a parade! I love the corps!" Ellen Ripley:"Newt, look at me. Where are they?" Newt:"They're dead, alright?! Can I go now?!" Ellen Ripley:"These people are here to protect you. They're soldiers." Newt:"It won't make any difference." Hudson:"We're on an express elevator to hell, going down!" Hicks:"I want you to put this on." Hicks:"It's a locater. Then I can find you anywhere in the complex on this. It's just a precaution." Hicks:"Doesn't mean we're engaged or anything." Hudson:"That's it man. Game over man! Game over!" 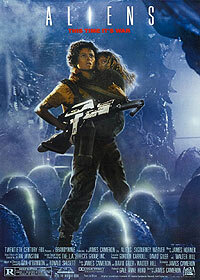 Ellen Ripley:"Get away from her, you *****!" Burke:"This is a multi-million dollar installation, ok? He can't make that kind of decision, he's just a grunt! No offense." Hicks:"I like to keep this handy...for close encounters." Frost:"What the hell are we supposed to use man?! Harsh language?!" Sergeant Apone:"All right sweethearts, you heard the man. Pull them out, come on, let's have them." Frost:"It's hot as hell in here." Hudson:"Yeah man, but it's a dry heat." Sergeant Apone:"Knock it off Hudson!" Ellen Ripley:"Did IQs just drop sharply while I was away?!" Ellen Ripley:"How long after we're declared overdue can we expect a rescue?" Hudson:"17 days?! Hey man, I don't want to rain on your parade, but we're not going to last 17 hours!" Hicks:"Looks like love at first sight to me." Hudson:"Vasquez, have you ever been mistaken for a man?" Newt:"We'd better get back because it will be dark soon, and they mostly come at night... mostly." Ellen Ripley:"I say we take off and nuke the entire site from orbit. It's the only way to be sure." Hicks:"I say we take off. Nuke the site from orbit. It's the only way to be sure." Burke:"This is so nuts! I mean, listen to what your saying! It's paranoid delusion! It's really sad! It's pathetic!" Ellen Ripley:"Just tell me one thing Burke. Your going out there to destroy them, right? Not to study, not to bring back. But to wipe them out." Burke:"That's the plan. You have my word on it." Sarge:"Alright, I want combat seating, you know your places." Hudson:"What are we going to do?!" Burke:"Maybe we could build a fire! Sing a couple songs! Why don't we try that!" Hudson:"Damn this floor is freezing!" Sergeant Apone:"What do you want me to do? Fetch your slippers for you?" Hudson:"Gee would you sir? I'd like that." Burke:"Ripley?! You know I expected more from you. I thought you'd be smarter than this." Ellen Ripley:"I'm happy to disappoint you." Newt:"You don't have to be sorry. It wasn't your fault."